Most exterior walls have insulation in between the wall studs, but allow significant energy loss through the studs themselves. Wall studs, both wood and metal, are poor insulators — when they come in contact with the exterior cladding, they allow heat to pass through them (which is called a thermal bridge). Insulated Vinyl Siding is vinyl siding with rigid foam insulation laminated or permanently attached to the panel. It fights thermal bridging by blanketing a home's exterior to reduce energy loss through the studs. The green solution creates a thermal mass and increases the overall R-value of the wall. In energy codes and energy efficiency programs, such as LEED v4, insulated siding is recognized as a form of continuous insulation. To find the best energy saving cladding for your home, look for VSI’s certification logo on cartons of certified insulated siding, product literature and websites. VSI’s Official List of Certified Products and Colors includes a full list of products and colors certified under the program. 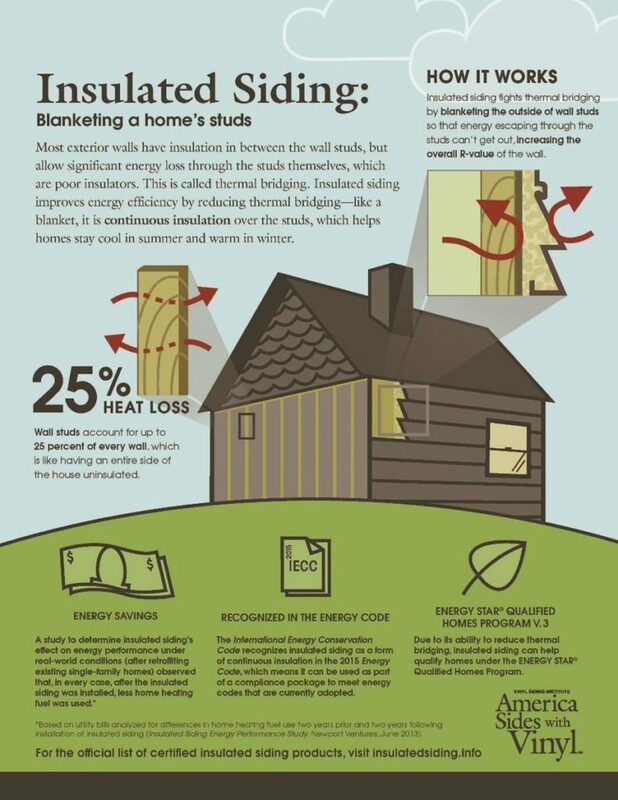 For more information about certified insulated vinyl siding, visit www.vinylsiding.org.